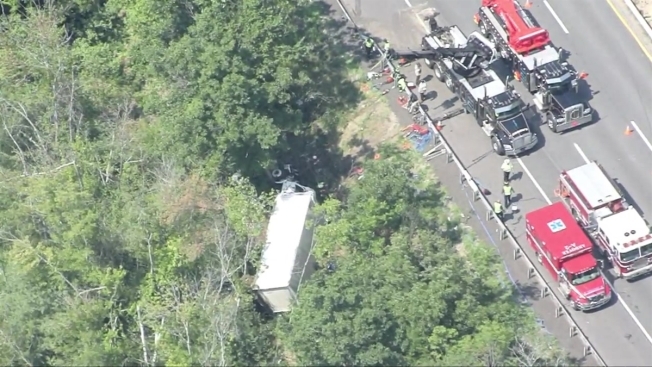 One person was seriously injured Monday morning in a crash involving three vehicles on Interstate 495 in Andover, Massachusetts. State police said a 68-year-old man from Ashland was traveling on I-495 north, just south of Interstate 93 at about 10:30 a.m., when the Hino box truck he was in somehow drifted into the right travel lane, striking a GMC Topkick truck driven by a 70-year-old Fitchburg man. The driver of the Hino swerved to the left and struck a Toyota Camry driven by an 83-year-old Sturbridge woman, who was traveling north in the left travel lane. Authorities said the driver of the Hino then crossed back over the travel lanes before rolling over off the right side of the roadway. The driver, who was not wearing a seatbelt, was ejected and pinned underneath his truck. The man, who has not been identified, was freed by firefighters and taken by medical helicopter to Boston Medical Center for treatment of serious injuries. The exact cause of the crash remains under investigation by Massachusetts State Police Collision Analysis and Reconstruction Section.